To get more and increase your earnings, you'll need to find new customers by promoting your listings in places other than LiveAdvice. Here are some tips and tools to help out. What are some quick, low-cost ways to get the word out? Feature your listing -- Put your listing at the top of your topic page, where potential customers will see it -- and only get charged when you're available to take calls and qualified customers click. It's the perfect online ad -- minimum risk, maximum reward! Learn more about Featured Listings now. Send an Offer Mail invitation to your acquiantances -- Use Send Offers to send an email with a FREE $5 offer to everyone in your address book -- and ask them to tell their friends. Send now. Give your business card to everyone you meet. Order your own business cards or print a flyer. Hand them out at work, weekend events, fairs, family gatherings, and trade shows. Order business cards now. Add your Call Button to pages around the Web. Place your Call Button on other websites where potential customers can find you -- like your business's website or your personal home page. Add Payment Mail Buttons too. Payment Mail Buttons let you create offerings that will be available to your customers 24/7 at a price that you set in advance. They're simple to create and you can place them anywhere on the Internet, whether it's on your listing or your personal web site or in email. Where else can I find new customers? Advertise online. Advertise on pay-for-performance search engines such as Overture, Google or FindWhat. Or advertise in online yellow pages or a website specific to your category. Create your own Web page. High-traffic websites such as Yahoo or AOL are free and make it easy to do.Learn more. Advertise in your local newspaper or yellow pages. Reach customers who aren't on the Internet. Get free publicity. Work with your local newspaper or radio station. Add your listing info to all your business communication. 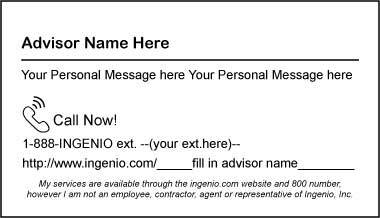 Add a link to your signature at the end of every email you send. Add your LiveAdvice home page address and 1-888-464-3646 (plus your extension) to your business stationary, business signs and any directories in which your business is listed. It doesn't cost anything! What should you tell potential customers? Your LiveAdvice home page address. If you don't know what it is, sign in and go to My Account. Look for a link to your home page under Tools. Your extension on 1-888-464-3646. You'll have a different extension for each listing. If you don't know what it is, just go to one of your listings and look in the left column.